It is the late notorious Queen of France Marie Antoinette that is said to have uttered the infamous phrase, “Let them cake,” and today Biggie echoed that very same words to The Chase Housemates. 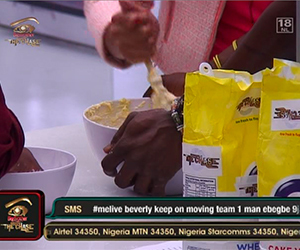 This week’s Task has already seen Housemates expressing their creativity through art and now Biggie has called upon them to get in touch with the master bakers within them. The Housemates have been instructed to develop a cake over four steps; this cake has to look like the Big Brother House. The theme of the cake is, “The Big Brother House as a gingerbread House”. For most of the day the Diamonds and Rubies have been hard at work in the kitchen with their confectionary creations. And it is evident that is not just the Housemates that have been enjoying this Task as many of you The Chase viewers have sent us your two cents on the matter. @kea_world - Ruby house will always remain the best.. Juhs dnt if y'all can bake.. (stressed) dnt burn the house down pls #BigBroAfrica #BBATheChase"
It is clear Africa is just as anxious as we are to see what the Housemates will come up with. Which House do you think will present the better cake at tomorrow’s Task Presentation, Ruby or Diamond?